iPhone provides one of the best mobile browsing experience among various smartphones. However, the small screen and Touch controls still can’t compare to the pixel real estate and tactile qwerty speed of a laptop. iPhone, with all its WiFi and 3G features, could be used as modem, allowing user to go online when on the road. Previously, the trick to tether and use iPhone as wireless modem has been done with MobileTerminal and 3Proxy. 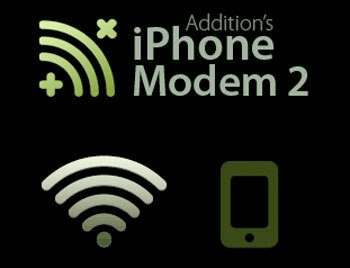 Now, a new iPhone app iPhoneModem lets the tethering process easier. To achieve aim of using iPhone as modem, iPhoneModem is available for jailbroken phones via Cydia. Follow the quick guides below. Download and install QuickPwn. Run the software and follow the on-screen instruction carefully. QuickPwn is an user-friendly jailbreaking application for Windows and Mac. The latest version works with iPhone OS 2.2.1. QuickPwn installs Cydia on your phone. Run Cydia, search for iPhoneModem by Addition and install it. Keep in mind you can only delete Cydia installed apps via Cydia’s Manage-Sources function. Now download and install the Helper App from iphonemodem.com to laptop or desktop computer (direct download link to Helper App for Mac – iPhoneModem.dmg and Helper App for Windows – iPhoneModem.msi.zip). The helper app is the right hand of iPhoneModem that automatically configures your computer and re-configures it back when you disconnect. Run the helper app and select Connect. The helper app sets up an ad hoc wireless network that can be accessed via iPhone. The default network it creates is called “iPhoneModem” and does not have a password. Open up your iPhone’s Settings and tap WiFi. Make sure WiFi is turned on and select the network “iPhoneModem” (or whatever you called it). Open up the Modem iPhone app and everything else will configure automatically. A while later, the Helper App and the iPhone Modem app will confirm a connection has been established. You can then browse away with all the comforts of your laptop. Tip: Enable Internet tethering without third-party app on iPhone OS 3.0.